Our neighbours are getting ready to build their new home. It is quite a huge task, not the least of it including the removal of a number of trees. And these are not your average suburban bushes, but towering 40+ metre (120+ft) mountain ash, up to 100 years old. 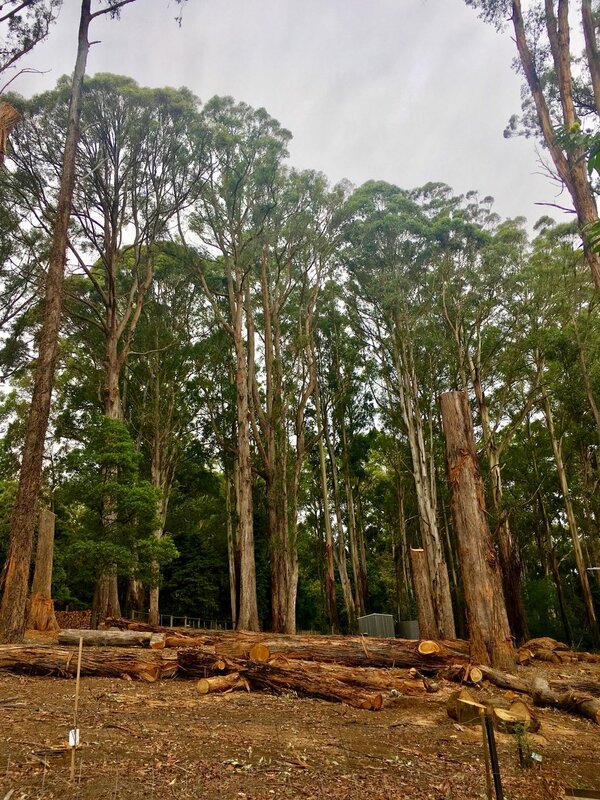 As these giants started to come down, my days were rendered with a backdrop of the whine of chainsaws, the cracking of timbers and the massive, ground shaking thump as they were felled. He is a God who creates space for life. One of the most profound examples of this comes from Genesis 1:1, where God creates the earth as void – the whole earth is created as a space for life - and then God fills it with an incredible abundance of life. Unfortunately, we have spent much of the intervening time re-filling our days with, and even chasing after, that which is not life and does not lead to life. We’ve done it since the fall, where we believed the lie of the enemy of our soul: that which looks good is good for us. We have often crammed our lives so full that there is no longer any space for God and the life He has for us. Recently, in conversations I had as I organised a prayer event, I came across numbers of people who said how much they wanted to be part of it all, a time to stop and seek God, but just didn’t have the space. This was not just individuals, but also a number of churches – their programs and schedules were already too full to be part of even an hour. Over the past year or so, God has been highlighting to me the need to be careful and to really seek Him regarding those things that I allow to fill my time. The last little while, this has intensified to the point where it is getting to the daily, to check in with Him: is this ok for me to pick up? As I reflect on the idea of these giants, I really feel that there is a strong call from God to His people - both at an individual and a corporate level – to reassess what we are doing. Are there giants that we have allowed to fill the space God has given us for life, within our days, our families, our church communities that actually need to be removed or even put to death? Have our programs, our activities, our busy-ness grown so huge that we don’t have time and space left for that which - if asked - most of us would put a high value on: our time with God, worshipping Him, praying, and simply waiting to hear from Him? Sometimes, as I look at our church services, perhaps the one time in the week we deliberately put aside for God - I feel that we can do the same even there – program out any space for Him. Often that time is tightly regulated: how long we worship in song, how long we pray, how long the message can go for, so that we can rush out and get on with all the rest of our lives. Are we willing and open for God to break into our sacred places and override us? My challenge to myself and to you is to set some time aside in the next few days – or even over Lent – to allow, or take back, some time for God to speak into those things filling our days. Ask Him if there are things He wants us to do less of or even stop? Are there giants in our lives that He wants to root out to give space for Him again? It may cost and be awkward – some people may not like it, nor understand; it may even cause some whining, upheaval and mess, but I promise you, it will be worth it!